Hey! I know I ghost this place a lot, but no time for formalities. It was 1:30am, I turn on the lights to mist my gargoyle for the night before I go to bed, and I IMMEDIATELY noticed something is not right with her vent (is it a vent on females too? I think it is). 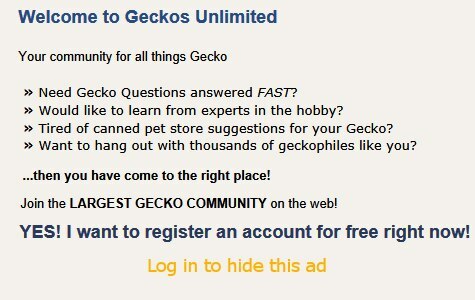 I have no idea what to do it's disgustingly difficult to find information on gargoyle geckos ANYWHERE because for some reason they're? Not common? I don't know. Please help. Links. Suggestions. Anything. I need to know if I have to take her to a vet. I don't want to stress her out and take her unnecessarily, she just got back into eating normally. Last edited by Cosmonaughty; 02-03-2019 at 02:06 PM. Your first photo shows no prolapse. Sometimes a prolapse can be reduced by sugar mixed with water. Try corn syrup instead, because sugared water was ineffective when one of my geckos prolapsed trying to pass a wee bit of sand. It took an emergency vet visit after hours to resolve that. Swelling and/or lumps can indicate an infection. For that an exotics vet needs to prescribe an antibiotic. Last edited by Elizabeth Freer; 11-16-2018 at 02:27 AM. Thank you! I'll have to call and talk to the vet in the morning (unfortunately people sleep at 2:30am). I'll let you know how it goes. Also, thank you for the link! Finding a vet who does mice with neurological disorders was tough, who knows how long I would have been writing up emails and making phone calls looking for vets who work on exotics on my own. Nobody here has any information online! crazy. I came here wondering if you could give some advice though? For about the last month or so, I have seen her eat nothing, except for when I leave mealworms laying around the floor (napkin substrate, she doesn't eat the napkin). She has gone without eating before, when she got bored of her food flavour. Should I be rotating her on several flavours to make her eat? How long can she go without eating CGD? I'm glad she was fine. Which flavor have you been feeding her? Has she lost weight? Has anything changed like the humidity? You're on the right track: a varied diet. Try rotating flavors. It's a great idea to alternate live prey with a reputable diet like Pangea's. What garg ever tasted powdered diets in the wild! Mealworms are OK for a change of pace. What diet do they get? What you feed the mealworms ends up in your garg's gut. For additional information click 98: Common Mealworm & Superworm Dry Diets & Beddings -- Use something else! Last edited by Elizabeth Freer; 02-03-2019 at 04:42 PM. Humidity hasn't changed, but it has been cold here. Just not too cold to where it was worrying or that i'd buy a heater. Florida escaped the polar vortex of america, too. I'll weigh her again tonight to see what it's currently at, but when she was eating regularly at the beginning of January, she was 44g. She's not lethargic and behaves regularly. I don't feed live mealworms, they're just dried ones I already had for mice, so I've no idea what they've eaten. My garg, however, recently was on Pangea's fig and insect mix, and before that we tried Repashy's "superfoods mrp" and Pangea's Watermelon. I tried reintroducing the Repashy, but she didn't eat it. She never ate the Watermelon the whole first month I had her, either, and doesn't eat it when I re-offer that. I guess I need to order a couple flavours to alternate and then try also some live insects, to get her going again? I don't know which is better, mealworms and superworms or crickets? Dubias are illegal where I live. Try well fed crickets first. Maybe in a feeding dish? My crestie George used to eat crickets all the time. Now he doesn't seem interested. George likes Pangea with Insects. Last show I bought Pangea's Papaya Complete Diet. He eats that too. I think a key thing here is alternating "lives" with Pangea from the beginning. Maybe it's the sweet taste of powdered diets that keeps them holding out for more. I think a key here is alternately lives with Pangea from the beginning. Maybe it's the sweet taste of powdered diets that keeps them holding out for more. So! I weighed her now. She's at 38g, which is only a 6g loss, not too bad, right? I got her to eat a little bit of her pangea fig and insect cgd when hand feeding, but mostly she just wanted to explore where I was sitting with her on the floor. I'm going to continue to hand feed while I wait for more flavours to come in the mail and I'll try and get some crickets after class tomorrow. Nobody near me sells cgd unfortunately. 6 grams off 44 grams in one month is significant. What day and night temps is the room where her enclosure sits? What is it usually? My Walmart carries these Anchor brand 8 ounce glass bowls. Cut off the cricket's back legs right below their "knees" to prevent them from jumping out of the bowls. Last edited by Elizabeth Freer; 02-04-2019 at 01:55 AM.